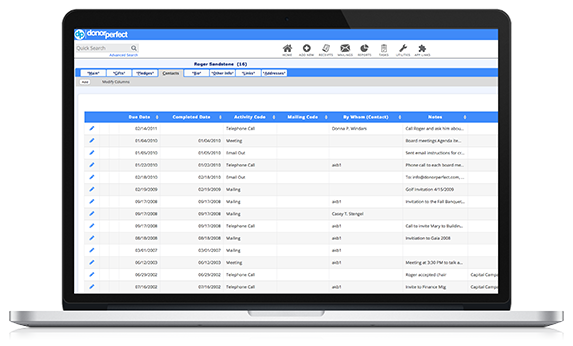 See all the development tools, features, and integrated functions you’ll have at your fingertips with DonorPerfect. 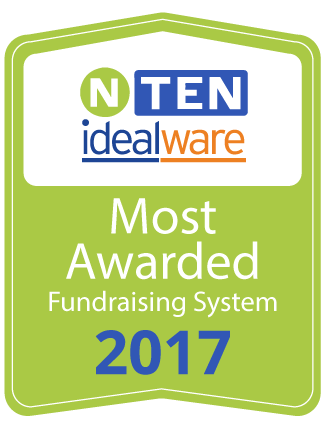 DonorPerfect fundraising software has over 25 years of fundraising experience built into its comprehensive system. Much of our growth is directly based upon continual feedback from our clients. Our proven methodology will enable you to grow your database of donors, increase giving, and retain donors year after year. 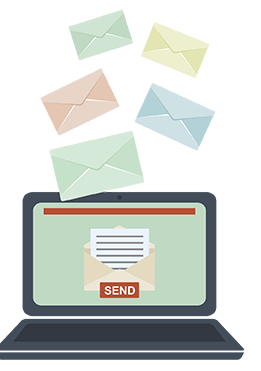 Using flags, mail codes, and solicitation codes, you can target solicitations, set follow-up activities and evaluate your fundraising efforts. Our moves management module provides a systematic approach to major donor development. No matter the outreach method, DonorPerfect provides the tools you need to track and grow your fundraising success. DonorPerfect makes it easy to get the word out and personalize messages about your cause which helps you stay in touch with donors and promote continued support. 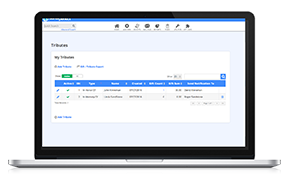 Merge the exact data you want into mailings, emails, faxes, and more. 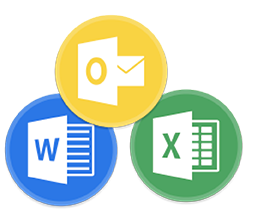 Instantly produce personalized letters in Microsoft Word or emails for one, all, or selected constituents. You can also quickly create an export file of selected records for your mail house. Our integration with Constant Contact allows you to create styled and text emails using over 400 design templates without any technical expertise and receive instant reporting on opens, bounce-backs, and other critical measures. 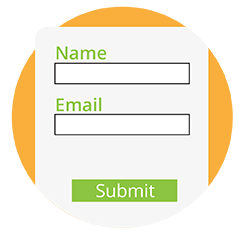 You can also collect email addresses from website visitors. Our partnership with Constant Contact also means you get the benefits of an integrated solution while they handle the extremely important management of email opt-outs, email delivery, CAN-SPAM law requirements, and more. Our integration with Microsoft Word and Excel enable you to export reports and communications formatted exactly the way you want them. Microsoft Outlook users can easily generate DonorPerfect contact entries based on email correspondence with donors, while Outlook Calendar integration allows users to export contacts from DonorPerfect to their Outlook Calendars. Focused solicitations reap better results, and DonorPerfect has the most powerful and easy-to-use filtering tools to enable you to precisely target your solicitations. In DonorPerfect, you can filter by any attribute including: flags, mail code, solicitation code, and recency or frequency of giving. You can use your chosen filters to create lists, reports and more. With DonorPerfect Online Forms, you can access an unlimited number of free online forms that integrate with your DonorPerfect database. Collect donations, event registrations, volunteer signups, and more. Create your own template and add your logo, photos, messaging, and automated response emails at no additional cost or choose from our stunning template library. Copy and edit existing forms to quickly build your own library of similarly branded forms, each with their own specific messaging for various purposes. You can also utilize our customization services for any advanced needs. Organize your efforts, reduce administrative tasks, and pinpoint the success of every fundraising event you host. Register attendees with DonorPerfect’s free integrated online forms. Collect registrant information and payments simply, seamlessly, and stylishly using DonorPerfect Online Forms.These free online forms can be styled to complement the look of your website and send all registrant information directly into your DonorPerfect system. Export invitee and registrant contact information for mail and email to send promotions, reminders, and more! Report on all the important aspects of your event. Get the stats on total attendees, total expense, net income, and more through auto-calculated fields and pre-made event reports. 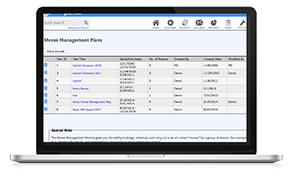 Arrange seating, tables, and team assignments on a virtual seating chart that can accommodate switches, swaps, and guest additions with the click of a mouse. Per unit or flat pledges for walk-a-thons, bike-a-thons, etc. 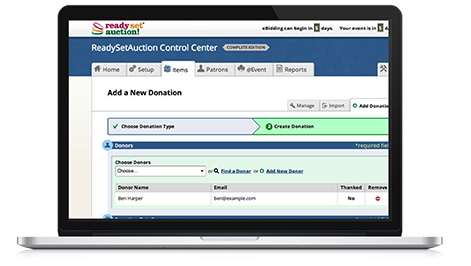 Add excitement to your event and boost your fundraising success by hosting an auction through auction solutions that integrate with DonorPerfect like ReadySetAuction. 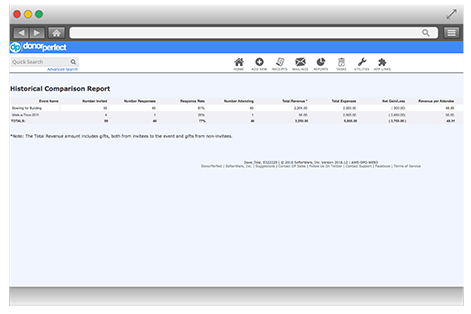 See metrics around every aspect of your events with event summary reports that you can view, share, and act upon at your next event. Donor retention is one of fundraising’s greatest challenges. A monthly giving program is a proven way improve donor retention, and in turn, boost revenue. 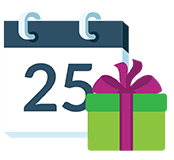 In addition to providing tools to manage the technical aspects of recurring gifts, DonorPerfect’s nonprofit experts have put together a series of resources to help you tailor your monthly giving appeals to maximize monthly revenue. 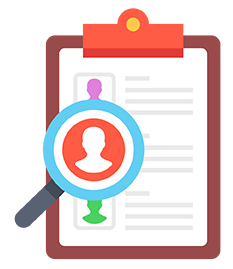 Grouping contact activities into a donor cultivation or moves management effort enables development staff to plan, coordinate, and track cultivation efforts. Moves management gives you the ability to design, schedule, and carry out a set of contact moves for a group of donors. 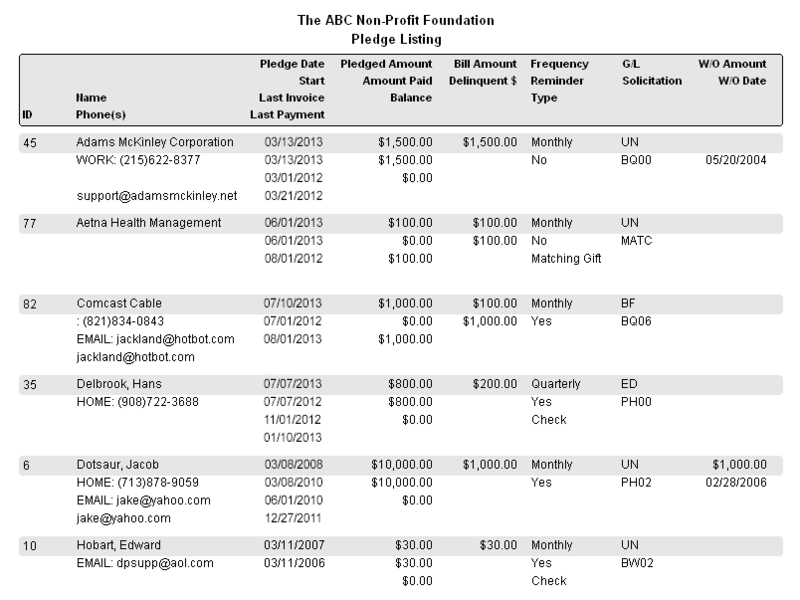 These moves identify, build relationships, and solicit contributions from prospective donors. SmartGive makes giving easier than ever. 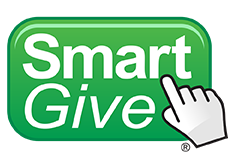 SmartGive pre-populates a donation form link with a previous donor’s address, phone number, email, and other information, so they can give in just a few quick clicks. You can place these donor-specific URLs in printed and emailed solicitations to improve the likelihood of donations, registrations, and more! Learn more about SmartGive shorturls. SmartActions enables you to set up actions that your DonorPerfect system will carry out automatically when specified triggers are encountered. For example, if a gift of $500 or more is entered into DonorPerfect (the trigger), an email notification can be sent to the Development Director and a call can be set up in the Contact Manager (the actions). You can set up as many SmartActions as you would like. 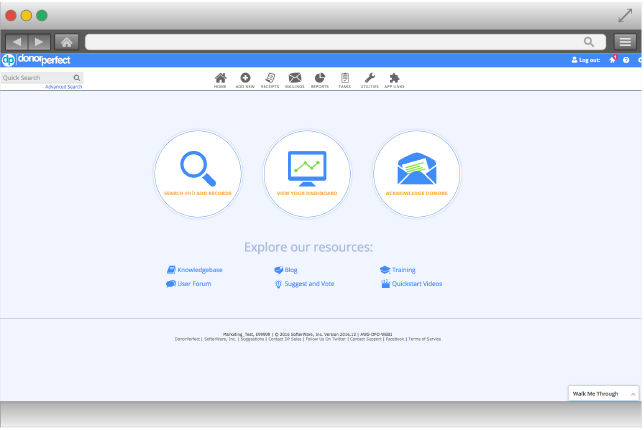 Create pop-up alerts and reminders, send emails, enter data into fields, and launch websites automatically. Learn more about SmartActions™ Automated Business Rules. 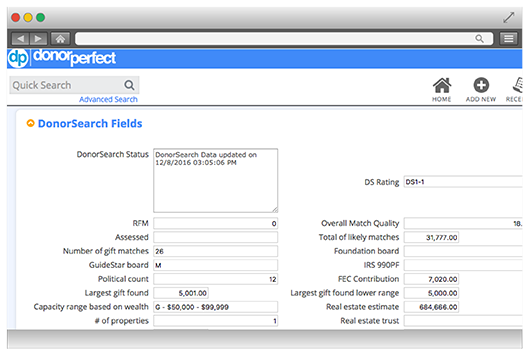 DonorPerfect integrates with DonorSearch, an innovative prospect research tool that specializes in wealth-screening and donor research. DonorSearch understands that donors who give are philanthropists, so they deliver prospects who are known for their philanthropy as well as their financial ability to give. 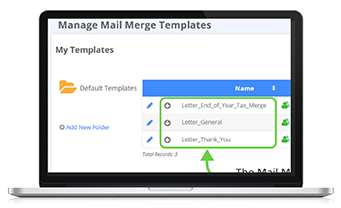 The Mail merge-purge feature removes duplicate names in your database by reviewing last names, addresses, and zip codes to identify and remove duplicates. No information will be mailed twice to the same person, which saves you time and money. Many donors don’t take advantage of matching gift options offered by their employers because they don’t want to deal with the process or they don’t even know that option exists. DonorPerfect’s integration with Double the Donation can change that. Let donors know they have a matching gift option the moment they give a gift. Make it easy for donors to submit matching gifts by providing them with all the info they need, including simple step-by-step instructions. Would you like to know what your donors are saying about you in social media? DonorPerfect’s social media integration allows you to easily search for donors’ Facebook, LinkedIn, and Twitter accounts and store them in DonorPerfect! Plus, as long as you have a Twitter account, your donor’s Twitter feed will display in DonorPerfect. Now you can keep up-to-date on all of your constituents’ recent activity and information, as well as keep in touch with each of them personally. You can also reach out to your most connected donors by tracking who has the most friends or followers on Twitter.